Intermediate Japanese learners need a lot of help. When learning a new language, especially Japanese, it can feel like you hit a wall when at the "intermediate" level—meaning you know most basic grammar and you can talk about basic day-to-day topics, but there is a huge gap in vocabulary knowledge. This intermediate wall can feel like it will last forever. The basics are too basic, but anything above that is too far above your level. This is the problem Satori Reader is trying to address. Made by the people who brought you Human Japanese, this website is trying to change the Japanese learning game by creating original reading and listening content for intermediate learners. Before we find out if the site succeeds on this promise, let's take a look at how it's tackling the problem. 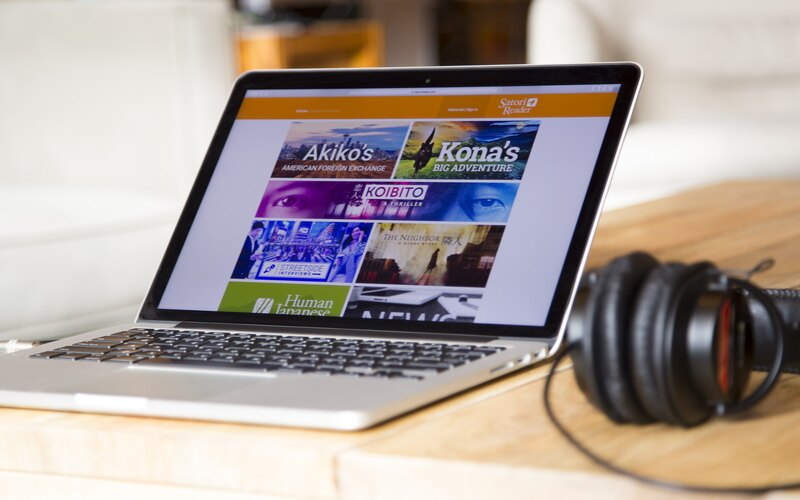 At its core, Satori Reader is a language shadowing tool. Language shadowing is a method of learning where you read and speak Japanese along with native audio. It can be anything from movie scripts, to news, to podcasts, as long as the written and spoken material match. Listen first, without looking at the script. Dive into both and slowly take away one. But no matter what, you eventually begin shadowing the material by saying it out loud at the same pace as the original. The goal is to make sure you completely understand how to read, hear, and speak the content. It is a strong, well-rounded tool in your arsenal of learning methods. Language shadowing is a method of learning where you read Japanese along with native audio. It can be anything from movie scripts, to news, to podcasts, as long as the written and spoken material match. But finding native material you can shadow with is no easy task; you need a script, audio, and an English translation. There are sites like NHK News Web Easy, which pair simple Japanese with robotic audio. But real news can be dull, and repeating after a slow-talking robot won't do your accent any favors. Content like this also tends to have furigana on words you already know (or think you know) which inhibits your progress. Plus, most good, native beginner material is aimed at children, which isn't helpful for adults trying to learn the language. Kids already know complicated grammar and tons of words that you probably don't. This makes some children's material way harder to understand than you may think. Satori Reader is here to address each and every one of these problems. The site has over 200 articles across fifteen different series, all curated to help teach Japanese with written scripts, audio, English breakdowns, and a lot more. But does it deliver on this promise? Is this the Japanese language shadowing champion we've been waiting for? Let's dive in and find out. 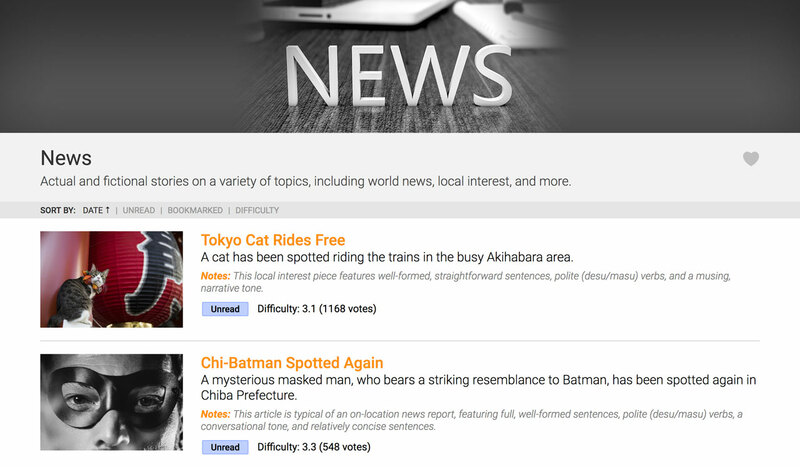 The layout of Satori Reader is simple to grasp (especially after going through the tutorial). You pick a story that interests you and dig in to the first page (which are called "articles"). Before you choose, you can check the article's Difficulty Rating to see if it's at your ability level. Unfortunately, most of the content on the site is rated close to a 3, which on a scale of 1–5 doesn't tell us anything. The articles are entirely in Japanese, which you can shadow either one sentence at a time by clicking the play buttons next to each sentence, or by playing the entire article with the audio bar at the bottom of the screen (which tracks with you as you scroll). After each sentence is an ellipsis, which reveals very literal English translations. By literal, I mean as close to the Japanese as possible, not a polished and localized translation you'd normally see when reading a Japanese and English book side by side. This helps you understand the original sentence as clearly as possible. You can also click individual words to bring up definitions, which show the meaning of a word in its context, not a simple gloss of the meaning overall. Conjugations are also explained, which is especially helpful with verbs and adjectives. Dotted lines allow for more definitions, usually for phrases and expressions, because most words don't mean only one thing in a particular context. When you click on a new word you don't know and want to study it, you can add it to your Studylist. The site itself is built to make sure you fully understand what you're hearing and reading, and not just in English. 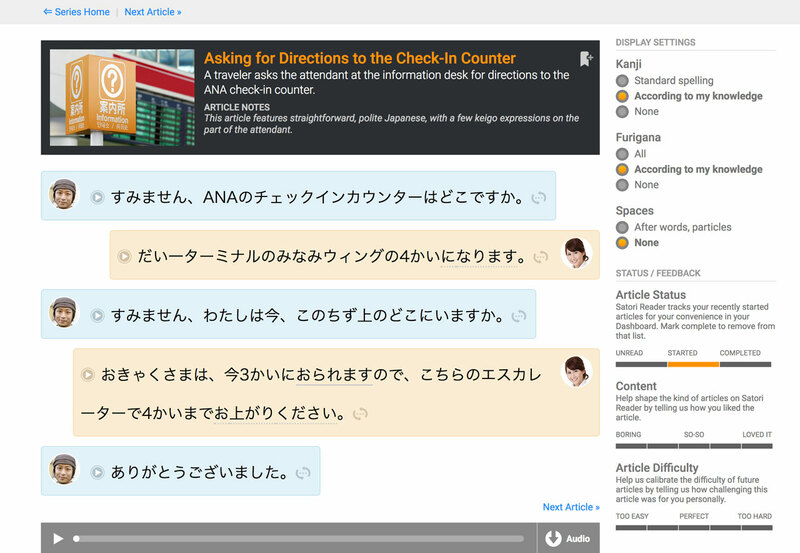 Satori Reader wants you to grasp the whats, whys, and hows of Japanese. Not everyone has a database of all the kanji they know, especially if you haven't used any of the methods Satori Reader lists. 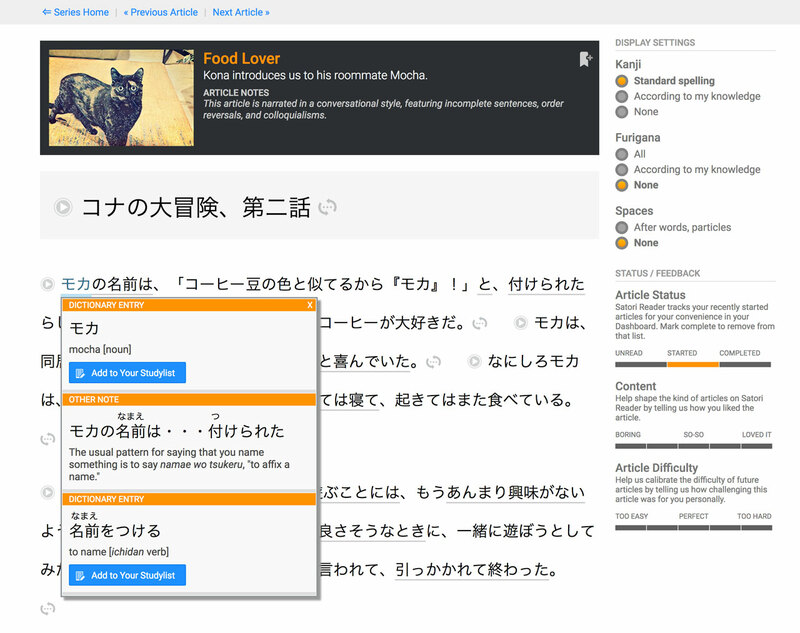 But if you use WaniKani, your personal kanji knowledge is stored and easily transferred to Satori Reader. "Standard spelling" is what you would normally see if these were articles published on any old Japanese website. "According to my knowledge" shows furigana and kanji based on the kanji you know, so you can learn more efficiently. For example, if you set Kanji and Furigana to According to my knowledge, kanji you know will appear without furigana. If you know one kanji in a word, but not the other, it provides furigana. And if the word contains all kanji you don't know, it will appear in kana. With these settings, you're able to practice reading kanji you do know and learn kanji you don't know. Over time, new kanji will hopefully get cemented in your brain so you can add them to your known kanji list and remove the furigana from them forever. In your Preferences you have a few options when setting your personal kanji knowledge. If you hit the configure button next to Other in Satori Reader, you can add your WaniKani API key. This automatically syncs to your WaniKani account (and updates every 24 hours), so your kanji knowledge info stays up to date. This takes a huge amount of work off your shoulders and makes Satori Reader work the way it should. And you never have to worry about adding new kanji you learn as you progress in your studies! The final piece of the Satori Reader settings puzzle is in the articles themselves. Some have two difficulty levels to choose from: Easier and Harder. Easier is similar to beginner-style NHK Easy content, and Harder is closer to actual, native Japanese (it doesn't pull any punches). Once all of your settings are in order and you start reading and listening to articles, you need a place to put all the new words you encounter. This is where Satori Reader's Studylist comes in. When you find a word you want to study (i.e. every word you don't know 100%) click on the word to find the definition and add it to your Studylist. 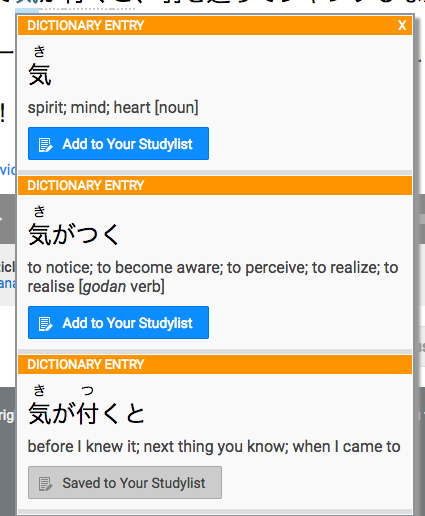 This creates Japanese-to-English and English-to-Japanese flashcards that use a spaced repetition system (SRS) and context from the original article to help jog your memory. The cards also link directly to the articles they came from, if you forget completely why this word is in your list. When reviewing flashcards, you're encouraged to think of the item, say it aloud, or write it. 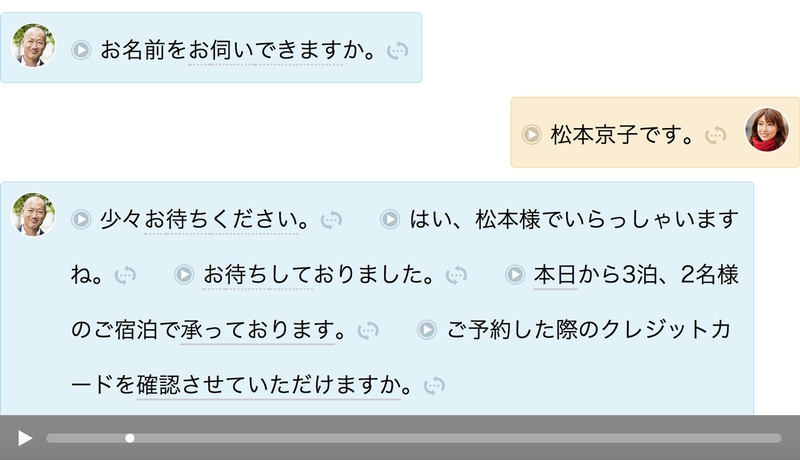 Then you can show the answer and rate yourself based on the difficulty; similar to default Anki. When you find a word you want to study (i.e. every word you don't know 100%) click on the word to find the definition and add it to your Studylist. 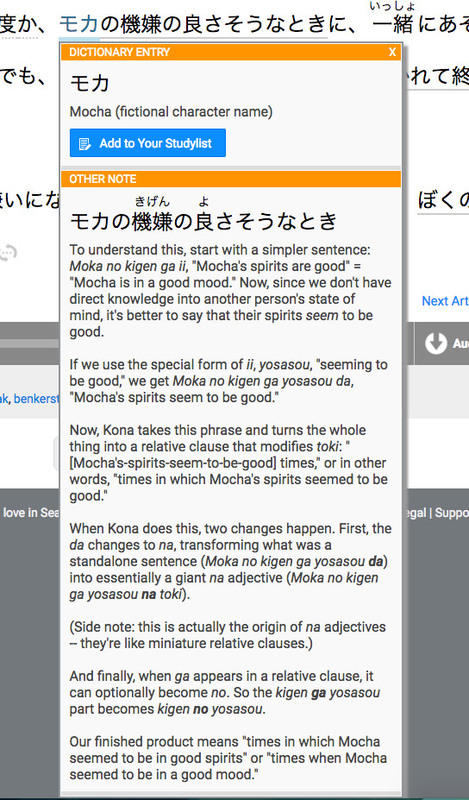 This creates Japanese-to-English and English-to-Japanese flashcards that use spaced repetition (SRS) and context from the original article to help jog your memory. A nice feature: the J→E and E→J cards are considered separate. So if you know the English meaning of a word well, you can focus only on the Japanese reading without having to see the English reviews as much. 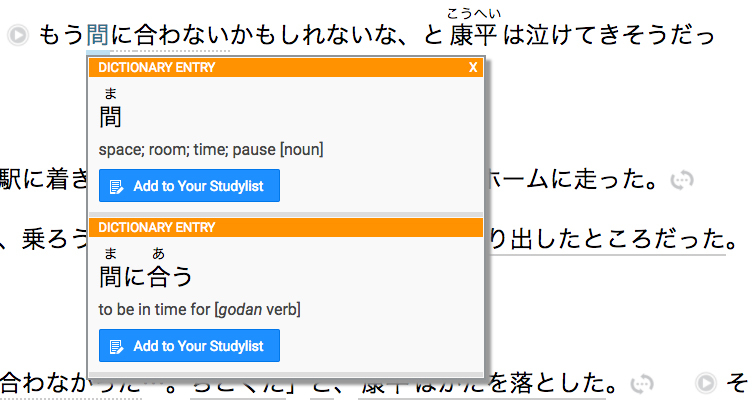 There are some problems with Satori Reader's Studylist though. For example, it's easy to add cards without actually learning what you're adding, and there's no limit to how many you can add at a time. This makes it easy to build a massive pile of words you want to learn. But when review time rolls around, you'll likely draw a blank on almost every item. Plus, there's a limit to the number of cards you can review (twenty at a time), so you can't whittle down your mountain of reviews if even you want to. Also, the Studylist doesn't force you to write in your answer, so it's easy to cheat yourself. When you can choose between three win conditions, you'll probably be too lenient on items you should be studying more, because it feels bad to mark yourself wrong. Basically, Satori Reader's Studylist lets you run wild, and if you don't set up good study parameters for yourself, the whole process will backfire. One good thing about Studylist: if you end up in the "oops, I added too many cards and I have no idea what any of them are" boat, there's a button that deletes all your cards so you can start over. You can also see how many cards you have due for review in your Studylist, as well as a Usage Heatmap stretching back six months (which I find to be a satisfying motivator). And that's the meat and bones of the site. It only has about three main pages, other than your settings, so while there are a ton of interesting, useful features, once you have them down it's simple to navigate. Now that you know how the site works, and about all the bells and whistles, let's talk about the content. What are you reading and listening to? Satori Reader boasts 200 articles, and while that number seems high, in reality the scope of Satori Reader's content is rather narrow. The bulk of that 200 exists in just two of the 15+ series: "Akiko's American Foreign Exchange" and "Kona's Big Adventure." 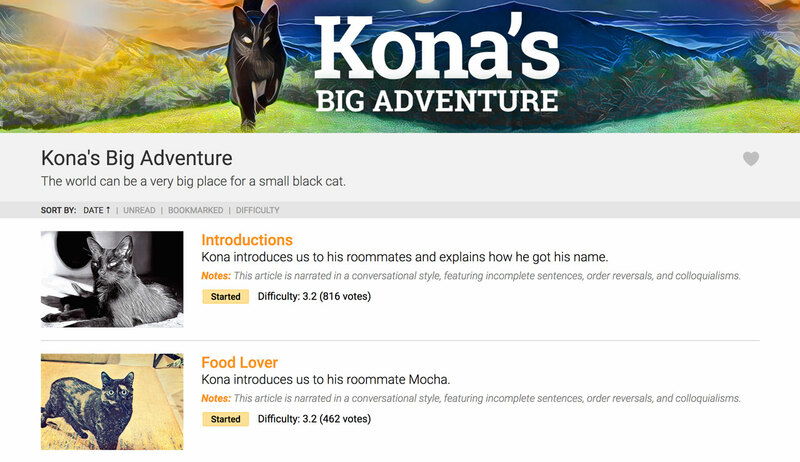 Kona's is the longest, at forty-one total "articles" (really pages). The rest of the site consists of a few stories about relationships, mostly, and then various dialogues that deal with important subjects for travelers and residents of Japan (e.g. Airport, Hotel, Restaurant, Train Station, Bus Stop, and Hospital). These dialogues are going to be the most useful for people learning Japanese to visit Japan. Because, let's face it, no one plans to go to the hospital or get lost in a foreign country. This is the language study you need if you want to move beyond studying for the sake of studying. All the audio is high quality and the voice actors are professional. It sounds a bit Genki-esque to me; great quality, but written with a beginner slant. Still, at the upper-beginner, intermediate level sometimes this kind of content can help you bridge the gap to understanding actual conversations. What I mean is this: most words are clearly pronounced and the voice actors speak slowly (for the most part). There are also the Human Japanese: Extra Credit and (soon) Extra Credit Intermediate sections. But if you aren't already familiar with the Human Japanese program, these sections will seem completely foreign and useless to you. That removes at least twelve "articles" from the list. And while I'm sure plenty of people are learning Japanese in hopes of finding a significant other/spouse, there's only so much of that kind of article we can stand to read here at the Tofugu office. None of us are looking, thanks no thanks. As far as difficulty level goes, most of the content is upper-beginner to lower-intermediate. If you've taken three years of Japanese classes or moved beyond most intermediate textbooks, you'll probably be leagues ahead of what the site has to offer. There is no dedicated intermediate or advanced content at the moment. No site is without its flaws and Satori Reader has some that we think all of you should know about. The big one is this: the window in which you'll actually need and benefit from this content is very short. Remember at the beginning of this review, I was talking about that intermediate wall so many of us seem to get stuck at? Though it seems like it lasts forever, it actually only lasts a few months if you don't give up. The problem is so many people see this wall as an excuse to quit. If you keep plugging away, you can make it out faster than you think, I promise. Satori Reader can seem like a great idea because it holds your hand with material you don't yet know. But if you continue at the same pace you were going as a beginner, you'll quickly outgrow this system. Because of this, Satori Reader can seem like a great idea because it holds your hand with material you don't yet know. But if you continue at the same pace you were going as a beginner, you'll quickly outgrow this system. It's important to let go of this safe, hand-holding method of teaching and go out into the real world with real Japanese content as soon as you can. I'm not saying the content on Satori Reader is "fake," but it is curated. And nothing in real life is like that. So you don't want to get too comfortable and settle into a routine that makes you feel good, but doesn't actually help you learn. Satori Reader's content is too advanced for beginners, but too watered down for upper-intermediate. If you aren't at the in-between sweet spot, it could be a waste of time, effort, and money. 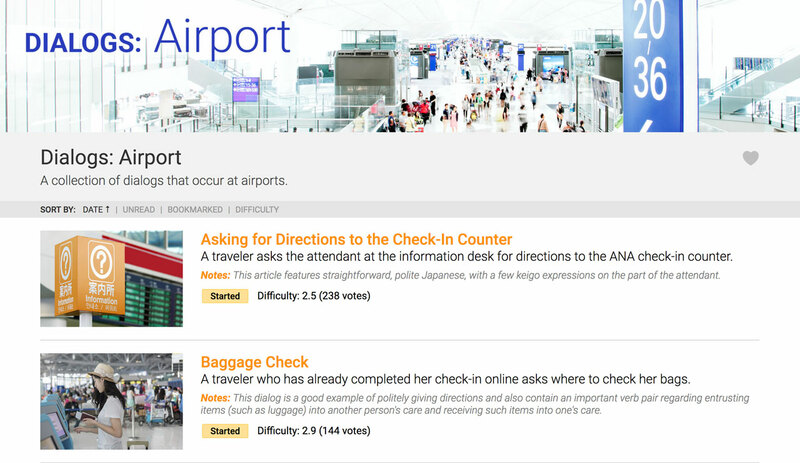 This can be tough news to swallow, but it's best you think about it now, so you can more accurately assess your needs as a Japanese learner. For those who are at that sweet spot, jump on this now while you can still benefit. Just don't stay longer than you need to. The Other Note section can get a little crazy. Like way longer than it should. There's no search functionality, so if you're looking for something specific, like a vocabulary word or grammar point, you won't be able to find it. And if you love a certain voice actor, and want to hear more audio they've recorded for Satori Reader, you'll have to sift through all the content and find it yourself. And then there's the Studylist, which as I said earlier, didn't live up to the expectations of anyone in the Tofugu office who tried to use it. Plus, if you never click on the Review tab or go to your Dashboard, there's no indicator that you have cards due. The Difficulty Rating doesn't seem to mean anything either, because most people who read a given article don't rate it, which results in a 3 (or medium) difficulty across the board. Plus, everyone's personal difficulty level is going to be different, so even if it was used as intended, it still wouldn't mean anything to individual users. A 3 to me might be a 5 to someone else. There are other small inconsistencies too. Sometimes I saw furigana above kanji I knew in WaniKani (meaning they were on my list to ignore). Sometimes I would see a phrase I wasn't familiar with but it wouldn't have the option to add to the Studylist. But we're nitpicking at this point. All in all, I think Satori Reader is a much needed resource in a world with too much content aimed at beginners and not enough to help poor, struggling no-longer-beginners. Things will hopefully keep improving for Satori Reader. They're still pushing out content, the newest being a spooky Halloween-esque story called "Koibito: A Thriller." And they've been on track, releasing at least one new article each week. We also hear they're working on iOS and Android apps, which will be a huge boost in the site's usefulness. As for price, Satori Reader has some free content. Usually the first two pages of each series is free to the public and you can use the functionality and reviews. The price is $12 a month or $99 a year. But they have frequent sales at lower prices so be on the lookout for those. All in all, I think Satori Reader is a much needed resource in a world with too much content aimed at beginners and not enough to help poor, struggling no-longer-beginners. There are some shortcomings, but nothing that can't be improved with more time and content. The system itself, and the care put into each explanation and note is where Satori Reader shines. The creators know their stuff and really want you to know it too. So use the site (at least the free stuff), and let the creators know what you're looking for and how they can improve it to fit your level and needs. The more people offering input, difficulty ratings, and support, the better! Satori Reader feels a little confused. In my mind (and I should note this is just my opinion), studying with these kinds of materials is not helpful for beginners. But most of the materials here feels geared and marketed toward that group. Speaking is unnaturally slow, furigana appears by default, and the topics are bland. Because Satori Reader is being pulled in two directions at once, it’s hard to recommend to any specific level. But there is a lot of potential if Satori Reader can figure out who its audience is. If done at a more normal speed, audio could be great for intermediate and advanced students. If the SRS flashcards were implemented better (input your answer instead of deciding for yourself) it could become someone’s main deck. If you could search for specific vocabulary across all stories, it would be great for reference. And, finally, if there was more material, as well as more variety (something that can be fixed over time, since they update regularly), it could keep an intermediate/advanced learner busy for a long time. I think if Satori Reader can figure out its identity crisis, it has the potential to become really great. But until then it’s hard for me to recommend, because I don’t know who to recommend it to. When I first started studying Japanese, I would dissect Japanese sentences and ask friends about things I didn’t understand. I loved learning this way, but it wasn’t efficient. 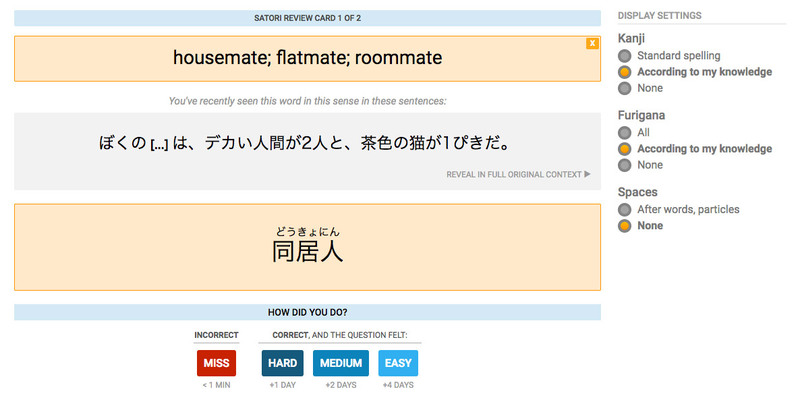 Now, years later, Satori Reader is my study method, but better. I can read Japanese sentences and get immediate answers about things I don’t understand. The benefits of Satori Reader only reveal themselves when you dig into an article and start ripping it apart. At first glance it looks like the whole experience is just a read-and-listen magic carpet ride. But once you start pulling apart sentences, you’ll feel comprehension dawning. There are some problems with Satori Reader though. The built-in SRS is no good. If the SRS was more customizable and had some kind of app for on-the-go reviews, it would be a slam dunk. At least you can export your Studylist to a .csv file, which is fine but not as good continually adding to an ongoing list you can use in the app. Also, article difficulty levels need to be defined by Satori Reader staff, not users. Pretty much every article is rated between 2 and 4. I spent too much time trying to find an article that fit my ability level, all because of Satori Reader’s nonsensical rating system. Despite these drawbacks, Satori Reader might be worth your time. If you get in there and study the sentences, you can get a lot of good out of it. That said, you might just study kanji more, and use other language shadowing materials with no furigana at all, later on down the line. I think Satori Reader is incredibly useful if you’re one of the people who fit perfectly in their niche audience. Unfortunately, the amount of time a Japanese learner will be in that sweet spot is fairly short. 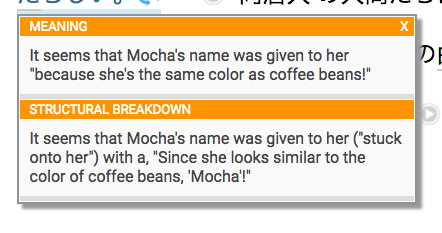 The mock conversations, in depth explanations, and ability to import learned kanji are great, but it’s still bogged down by a clunky SRS Studylist, superfluous ratings, and too-easy audio.